Comment: I would like to get an estimate for helping me assemble outdoor storage shed. 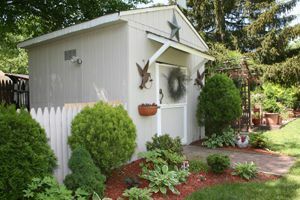 Comment: Need a 12x12 or 12x14 outdoor storage shed in my backyard. Comment: I would like to get an estimate for wooden gardening shed. 40 or 50 years old. clapboard siding. dry rot on the bottom exterior. Comment: Front porch needs rescreening; gutters, few windows, roof and siding replacement needed. Comment: I would like to get an estimate for Small work space not connected to house with electric, water , counter tops , sink. Comment: Converted condominium sunroom balcony has water intrusion from open balcony above when it rains. Comment: Would like to add a nice gazebo to my backyard. I am planning a September wedding and would like to use it at that time. Atlanta Shed & Enclosure Builders are rated 4.68 out of 5 based on 320 reviews of 19 pros. Not Looking for Sheds & Enclosures Contractors in Atlanta, GA?